Do you want to read this study in English? Not for the diseases their products cause when used as intended. Not for the deforestation caused by tobacco cultivation or the contamination of soil and water caused by chemicals used on tobacco fields. Even not for the obvious waste, toxic waste, the removal of toxic cigarette butts. Cigarette and leaf tobacco companies don’t pay for this. The price of tobacco is paid by flora and fauna, on land and under water. It is paid by humans, in tobacco growing areas, on sea coasts, in cities. 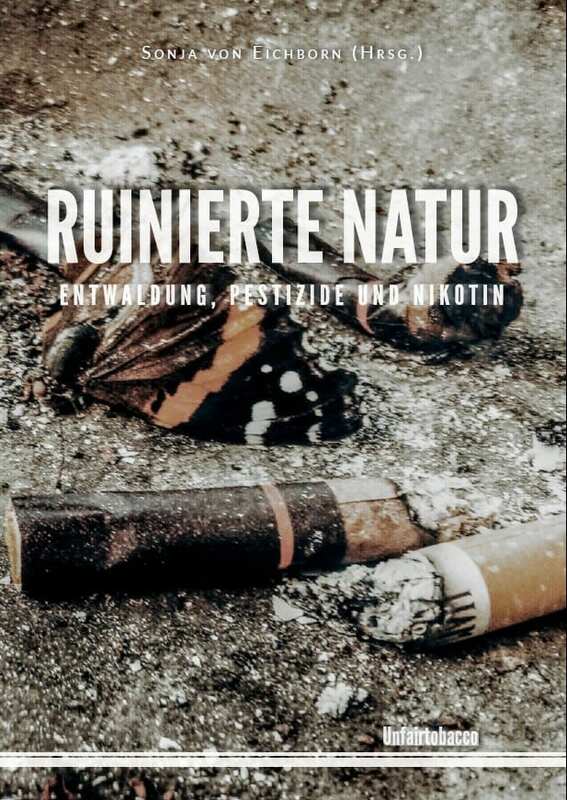 Our German study “Ruined Nature” highlights how the tobacco business harms the environment. The ecological footprint of the tobacco industry has very different effects on regional and local level. Our study “Ruined Nature” [German] takes a closer look at places where the price of tobacco is being paid. In the tobacco growing areas of Tanzania, forests are cleared to make way for new tobacco fields and to supply the tobacco barns with fuelwood. Mwita M. Mangora shows the magnitude of deforestation in the miombo woodlands and the consequences for the local communities. Read here his chapter “Tobacco takes its toll on the miombo woodlands”. In Bangladesh, agrochemicals – fertilizers, fungicides, pesticides – used in tobacco cultivation contaminate the fertile river banks and the water of Matamuhuri river. Farida Akhter demonstrates how tobacco is occupying agricultural land and which consequences local communities face due to the diminishing fish stock. Read here her chapter “Tobacco ruins soil and water along Matamuhuri river”. In Germany, cigarette butts are a major concern. They are littered although they consist of plastic and contain many toxicants. Susanna Knotz describes how the German coastline of the Baltic Sea is affected and which actions against this contamination are already taken on a local level. Nevertheless, there are options to minimize the damages – in tobacco growing countries, in countries with large cigarette manufacturing or with high smoking prevalence. These require financial resources. It is time to use the concept of Extended Producer Responsibility for the tobacco industry. Multinational companies in the tobacco sector must pay their share of the price of tobacco. Measures to be taken include for example fees or taxes to finance afforestation schemes and support farmers to switch to alternative crops, restrictions for tobacco cultivation like minimum distances to rivers and other water bodies, or financial contributions to bear the cost of tobacco waste management. Read more in our study “Ruined Nature” [German]. Our new factsheet shows the impact of tobacco growing, cigarette manufacturing and cigarette butts on water, waterbodies and oceans. A German documentary shows: Cigarette butts not only harm the health of people, but also the health of the planet. Few people know, cigarette butts are hazardous, toxic waste. Unfairtobacco Director Sonja von Eichborn has been interviewed for this film.